The State Board of Health is looking for comments to amend the Private Well Regulations. If you have suggestions, speak up and contact the VWWA office or Dwayne Roadcap direct at the office below. The public comment period will be open until October 31, 2018. 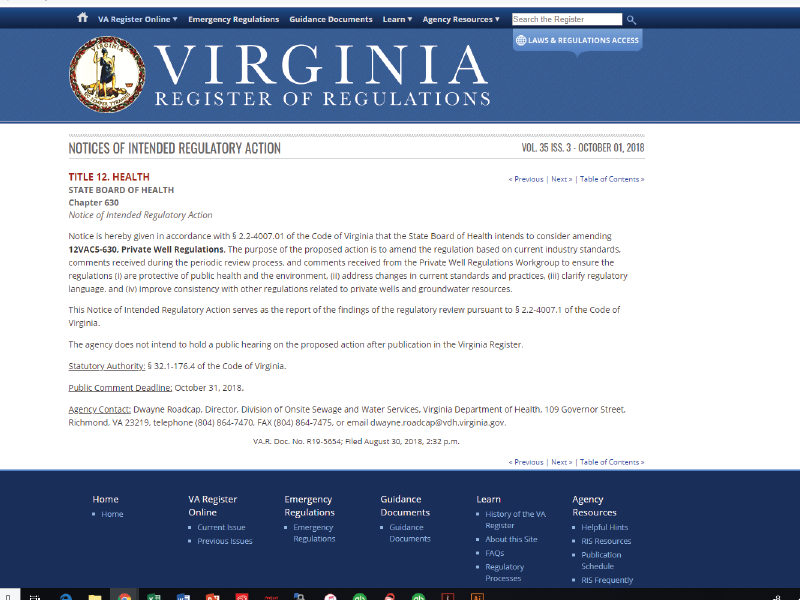 Notice is hereby given in accordance with § 2.2-4007.01 of the Code of Virginia that the State Board of Health intends to consider amending 12VAC5-630, Private Well Regulations. The purpose of the proposed action is to amend the regulation based on current industry standards, comments received during the periodic review process, and comments received from the Private Well Regulations Workgroup to ensure the regulations (i) are protective of public health and the environment, (ii) address changes in current standards and practices, (iii) clarify regulatory language, and (iv) improve consistency with other regulations related to private wells and groundwater resources. This Notice of Intended Regulatory Action serves as the report of the findings of the regulatory review pursuant to § 2.2-4007.1 of the Code of Virginia. Statutory Authority: § 32.1-176.4 of the Code of Virginia. Agency Contact: Dwayne Roadcap, Director, Division of Onsite Sewage and Water Services, Virginia Department of Health, 109 Governor Street, Richmond, VA 23219, telephone (804) 864-7470, FAX (804) 864-7475, or email dwayne.roadcap@vdh.virginia.gov. ⟵Question: What is the best air compressor?